Kid-friendly hotels in Montreal that can accommodate 5 or 6 in one family room or suite are listed in alphabetical order below. The price per night, or rate range, of each hotel is indicated by the $ symbol. See the $-symbol key in the right sidebar. Large hotel rooms, family suites, an apartment hotel, and a hostel are included in the list. You’ll be able to find the best place to stay in Montreal for your family. If you’re looking for a cheap place to stay, check out the hotels with $$ or $$$. If you are seeking luxury amenities for your family, check out the hotels with $$$$ or $$$$$ under the hotel name, below. All the listed hotels have a private bathroom, even the hostel. Some of the hotels have large family suites, such as one-bedroom or 2 bedroom suites in Montreal. Click on a hotel name below to see more details such as a location street map, room configuration description, and hotel amenities. You’ll also find information about how to check reviews, availability, and booking a room instructions. Also included in the detail description are room bedding options. The list includes rooms with King, Queen, extra or sofa beds. Many family hotels also offer extra beds, often called rollaway beds, or cribs (called baby cots by some hotels). Frequently, use of an extra bed is associated with an extra fee per night, whereas cribs are often provided free of charge. It’s best to reserve ahead of time, if possible, since the hotel likely has a limited supply. Some of the listed hotel rooms have a kitchen or kitchenette for heating leftovers or cooking meals while on family vacation. Even the hostel listed had a kitchen for guests to use. 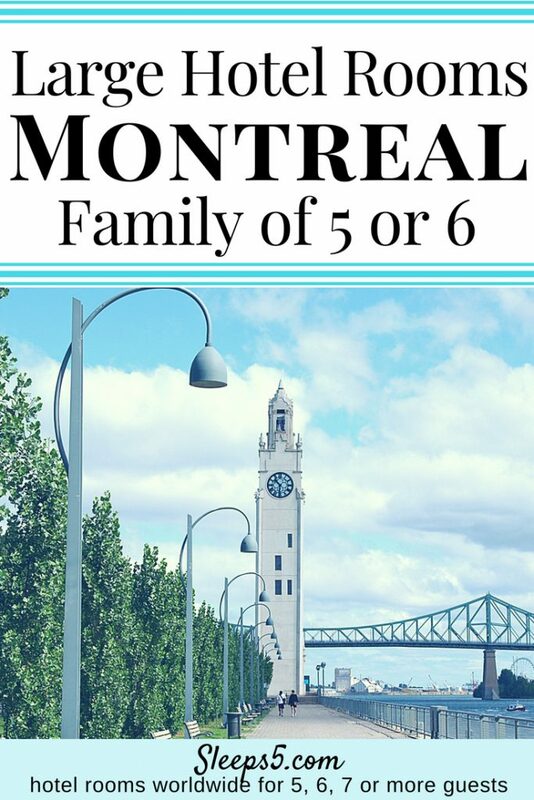 We hope this list helps you find the perfect place to stay in Montreal with your kids! See the Sleeps5 menu for lists of hotels for 5 or 6 in other cities. Click Sleeps5 Toronto to see another list of hotels for 5 or 6 in Canada, or Boston or New York City, for locations closer to Montreal.